The North Pole Satellite Station is owned and operated by SSC Space U.S. It includes several independent antennas with capabilities for Telemetry Tracking & Command (TT&C) and data downlink services. The ground station supports multiple frequency bands including S-Band (up and down), X-Band (down only) and SGLS (uplink). The ground station also includes an operational office which houses system electronics and data processing equipment. The station is located in North Pole Alaska, which is 16 kilometers south-east of Fairbanks. The station is located at 64º 48' North latitude and 147º 30' West longitude and is situated 149 m above sea level. The location is particularly advantageous for accessing high-inclination orbiting satellites. The station is frequently used for LEO missions for both orbit raising and daily pass supports for polar orbiting satellites. 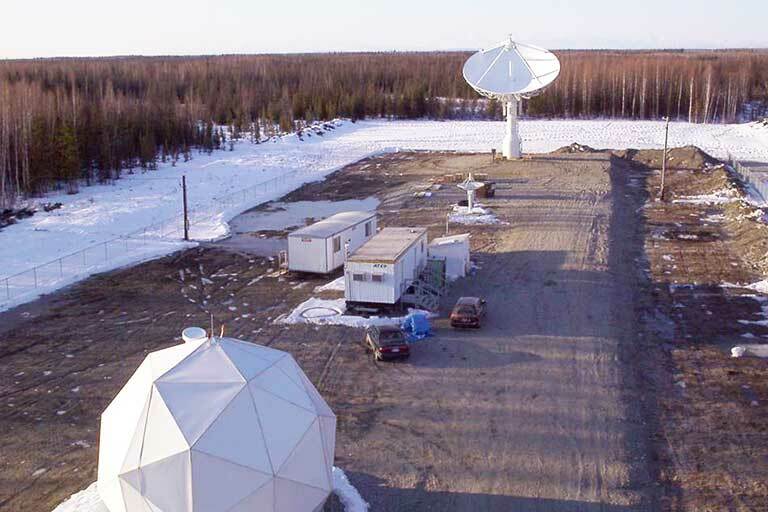 It complements our Esrange Satellite Station in Kiruna, Sweden, by providing additional contact opportunities for ground coverage on every polar orbit. When utilized in conjunction with our global network of ground stations, Chile, Hawaii, and Australia, and with collaborative stations in Europe and Africa, it offers customers unprecedented coverage for high-inclination missions.